The broker works for you. The bank doesn’t. The right mortgage is a critical factor determining long-term savings. 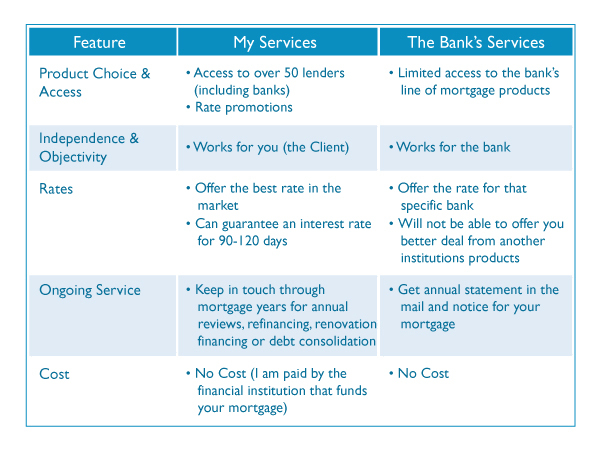 The value of a professional mortgage broker comes from having someone who objectively works for you and is not limited to mortgage product offerings from one source; like a bank. Advice on choosing the right mortgage option considers interest rate, payment privileges, payment penalties, long term savings and much more. You never have to worry about a better mortgage on the market – you will have it. I work to find you the best solution. Call me today!